I don’t know how to review this film…I don’t even know where to start, so let me just jump to the part where I tell you to watch Me, Earl, & the Dying Girl. Based on Jesse Andrews’ best-selling novel, this film follows Greg (Thomas Mann), his “co-worker” Earl (RJ Cyler), and a dying girl, named Rachel (Olivia Cooke). The film opens with Greg’s voiceover narration about how he has survived high school; a friend to everyone, but a friend to no one. Yes, this is another film about high school seniors, with that introductory high school sequence, that we have all seen before. This is the part in the review where I tell you, you’re wrong. Director Aldonso Gomez-Rejon uses subtle camera tricks in this sequence, instead of the flashy freeze frames paired with snappy sound effects technique, that we have seen in films that came before it. Throughout this entire movie the camera is an active mind’s eye that brings a sense of urgency to the screen. Gomez-Rejon is able to project the scene’s emotional action through the camera’s movement, like a cinematic waltz. 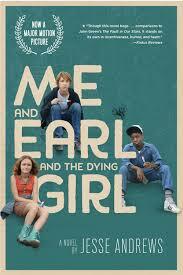 Me, Earl, & the Dying Girl is a small, independent film, but at times it feels larger than life. This is the part in the review where I tell you that this is a high school based romantic comedy, where the popular guy falls for the nerdy girl; but this is not that type of film. There is some romantic tension brooding beneath Greg’s “doomed from the beginning friendship,” with Rachel; but it’s more about a genuine connection than romance. Greg and Rachel form an unlikely, quirky friendship, similar to Andrew and Sam’s connection in the movie Garden State. During their first encounter, Greg describes to Rachel about how she can pretend to enter a sub-human state, when someone really annoying tries to talk to her. This is reminiscent to the Garden State scene, where Sam talks about how she invents random noises when she stresses out about life. Gomez-Rejon is able to tether these teenage character’s innocent wonder about life under the weight of maturity throughout the story. He captures the same authentic, adolescent spirit as John Hughes did in The Breakfast Club. After watching this film, I can only expect more great films from Gomez-Rejon are in our future. Again, this is a coming of age film about Greg grappling with the end of his adolescence during his senior year in high school. Simultaneously Gomez-Rejon frames a poetic love letter to filmmaking. Greg and Earl spend their time making classic movie parodies, that Rachel watches as she undergoes treatment for leukemia. This is the part in the review where I tell you, that as the story unfolds it was truly “the best of times and worst of times,” for these three friends. Now go watch the winner of the Grand Jury Prize and the Audience Award at the 2015 Sundance Film Festival.